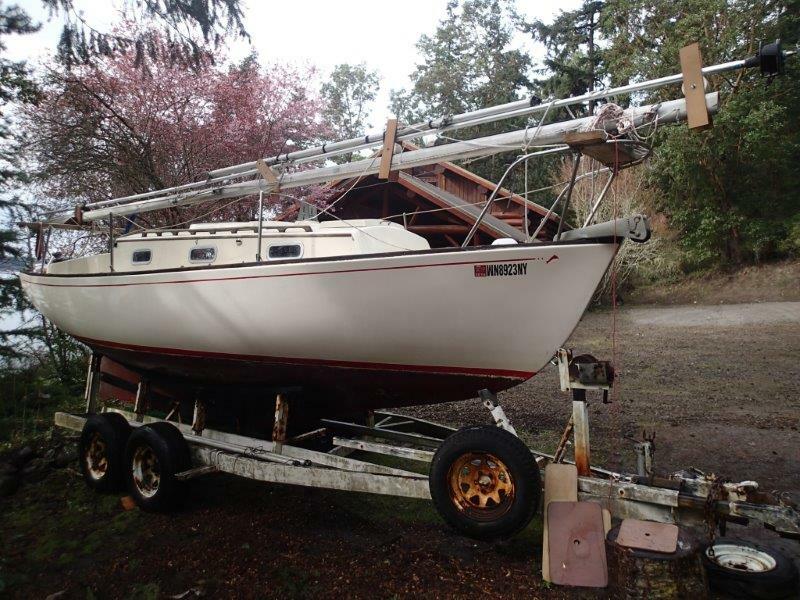 Brad Miller's Sonrisa, Yankee # 168, Sequim Bay, Washington has been bought by Harold Schmelzer and now rests grandly next to my house in Portland, Oregon. 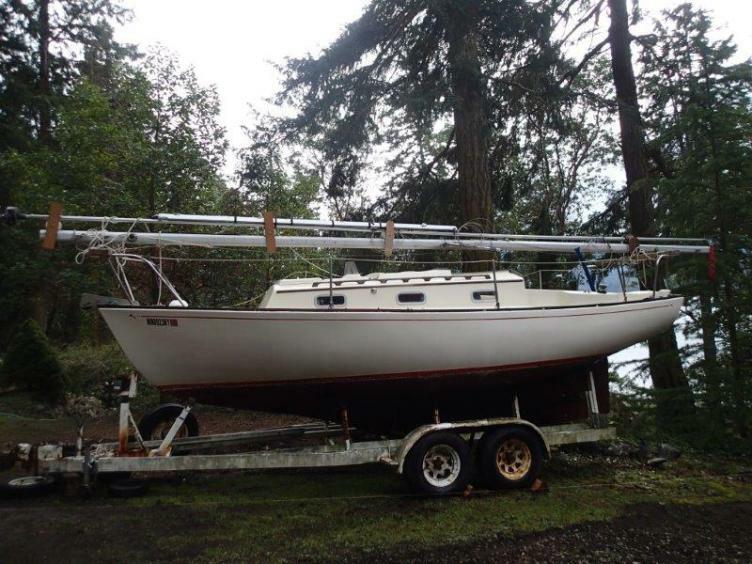 This adds to my fleet of a canoe, a recreational kayak, and Montego 19 sailboat. 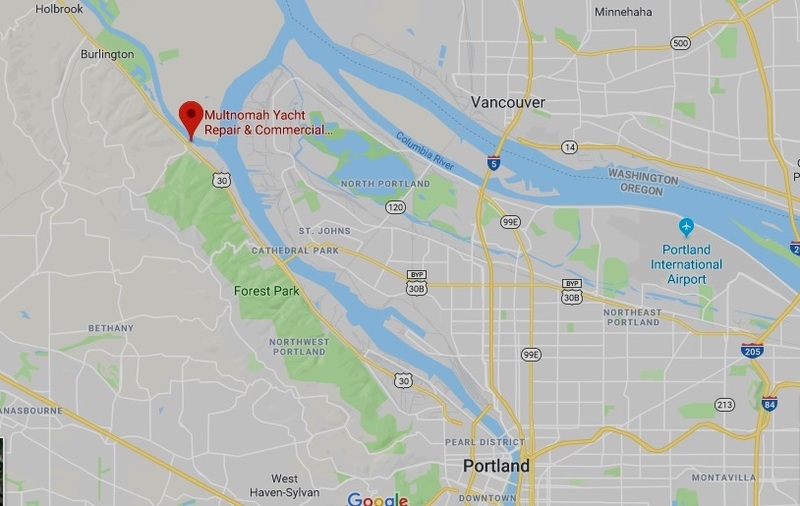 I keep the Montego (built in Florida) in a slip on the Multnomah Channel just off the Willamette River. The Dolphin will replace the Montego I have had for thirty years. I am working my way through the registration paper work for the trailer and the Dolphin. I have to take the trailer to DMV so they can verify the VIN number. The Dolphin is easier to do through my local marina. The Dolphin is only 4 and a half feet longer than the Montego and they have the same beam. The size and weight of the Dolphin in real terms is double my current sailboat. I am in awe of the mast and rigging. 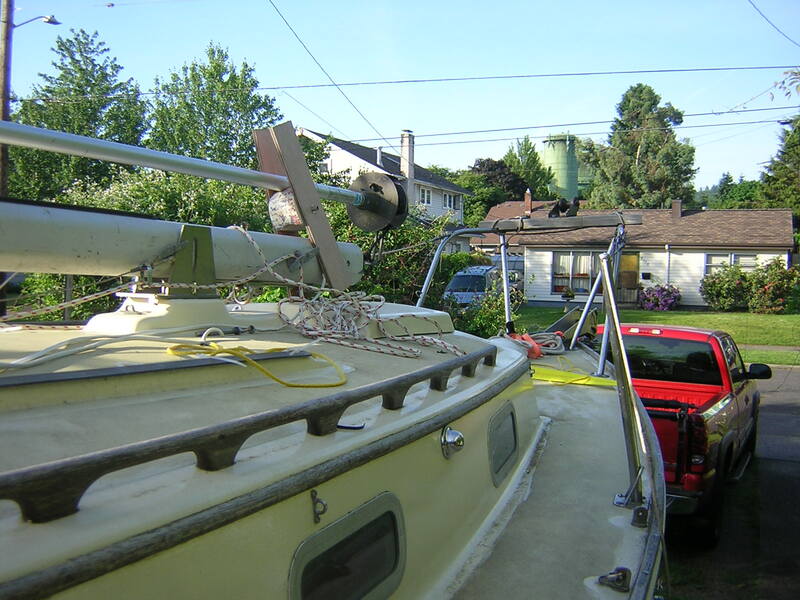 The previous owner took good care of the Dolphin and repainted the deck and topsides. 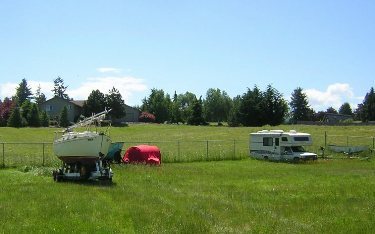 Here are a couple of pics from the 216 mile white knuckled ride from Sequim to Portland. Your website sold this boat to me. (Dolphin24.org staff - take note!!) I kept going back to the laptop as we experience the longest and wettest winter in 20 year here in the Pacific Northwest. December 12, 2017. We have the following update from Hal. My favorite Dolphin is resting happily in her slip in Multnomah Yacht Harbor. I bought her in Sequim, Washington and spent the next four months getting her ready for her new adventures. 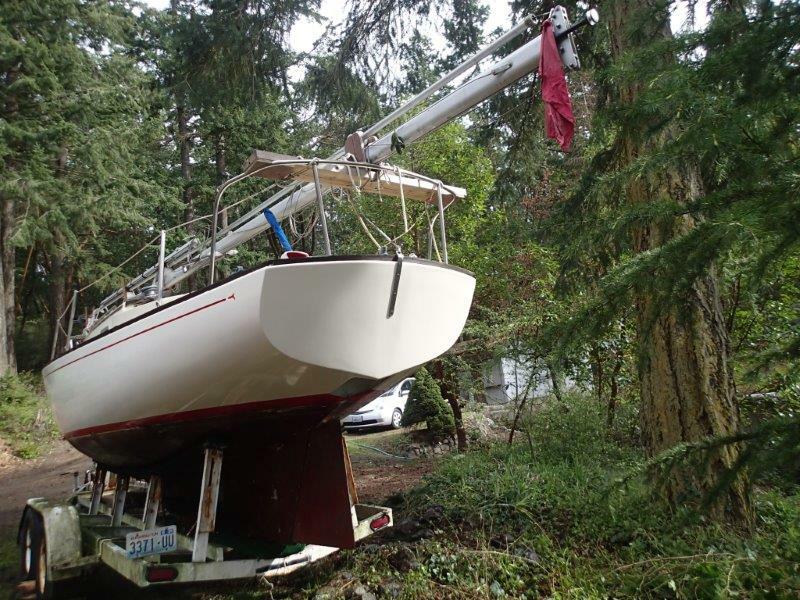 She spent the summer and early fall in my side yard on her trailer and later in the yard at Multnomah Yacht Harbor. Lots of work got done. 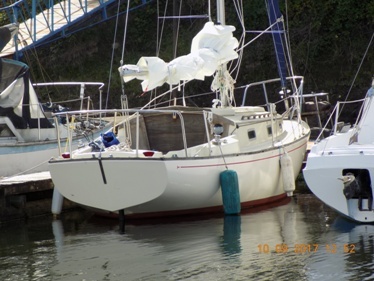 She now has a new CDI roller furler, a new furling 135% genoa and a new cruising main sail from North Sails. I had a rigger make up the roller furler, life lines and standing rigging. The rigger installed the life lines and then left me to do the furler and the rigging. He went off to race on a guys boat who had more money than me. Go figure. I installed custom lazy jacks and my one year old Merc long shaft 4 horse power motor from my other boat. I have a new 6hp Tohatsu in the crate in my boat house (shed) that needs to be broken in this spring. The Merc pushes us along just fine and starts with two pulls. Good for now. We finally got out in the Willamette and Columbia rivers in late September and early October. My grown son, Harold III, put the rail under for the first time when he was at the tiller. Great Fun. What a boat! Sails like a dream, light airs and medium. Looking for heavier sailing this spring. Thanks for all your hard work on the website. I used it time and again to figure out things. I will be sending smaller emails with technical posts and pictures. Oh, the new name? Got a short list I am working on. December 22, 2017. Hal's been busy and updates us in 3 areas - They have been added to the relative areas in the Technical Section. Click on the titles to go there. January 29, 2018 Hal sent in the following update, and a name change! 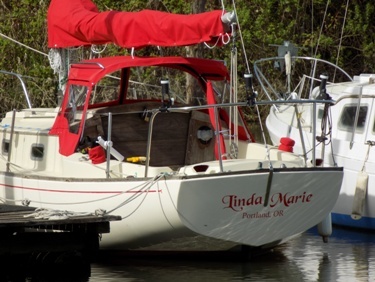 I have changed the name of Yankee Dolphin #168 from Sonrisa to Linda Marie, in memory of my late wife. 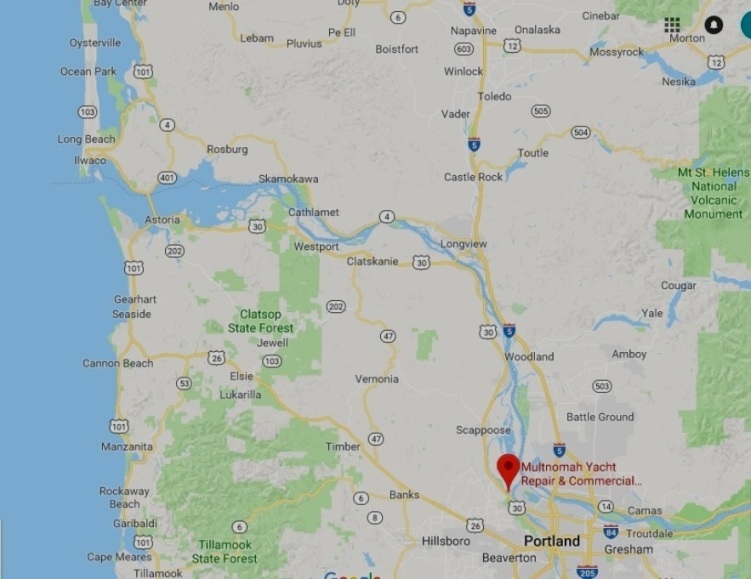 Her hailing port will be Portland, Oregon. BoatUS graphics is working on the lettering. They did a fine job on the new (Oregon) registration numbers, so I am hoping they will look right. I have a Dodger ordered and will send pics for the technical section when it is installed. 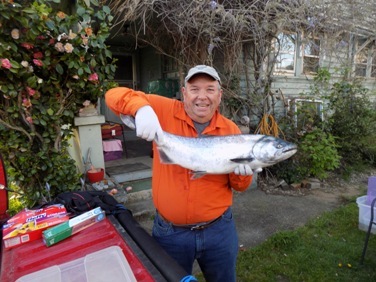 It is almost time to start spring salmon fishing here on the Willamette River. 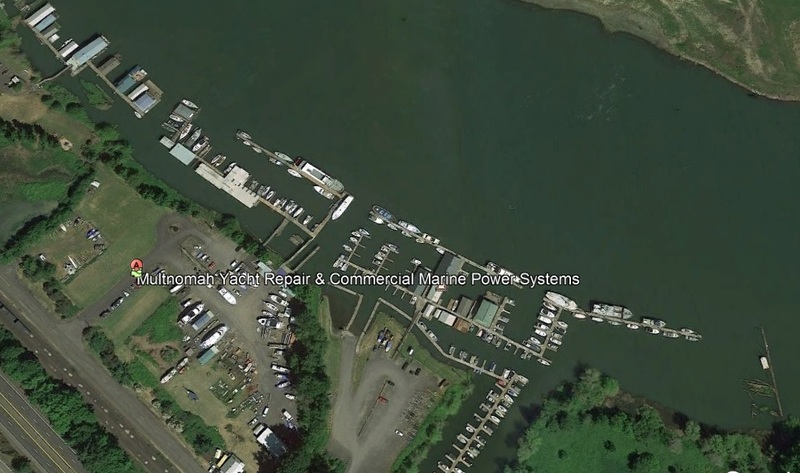 Webmaster Note: Harold's email advising of his decision to change #168's name (one of many similar over the years) has prompted website staff to add a long overdue item to our Technical Section - Naming and Re-Naming of our Boats. Click here to go there. Columbia rivers. That was in March thru the end of September, when I pulled the boat out. I had ten hook ups and got six in the boat. 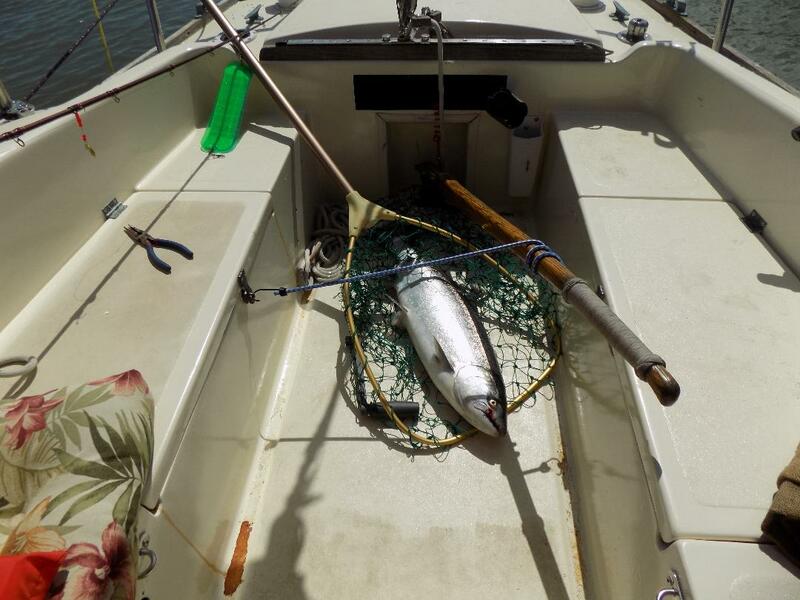 DOLPHIN 24s make great river trolling boats. I have a 4 horse Merc longshaft in the well and at idle it is a perfect speed. 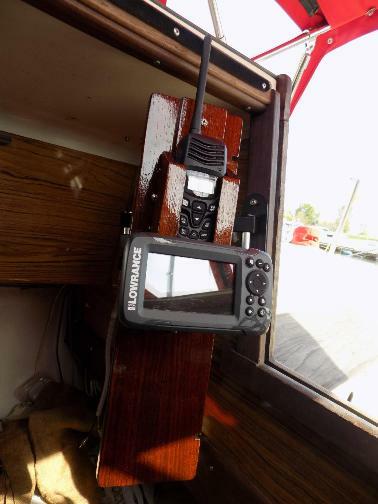 I replaced the old depth sounder, added four rod holders, and a new dodger for the rain. 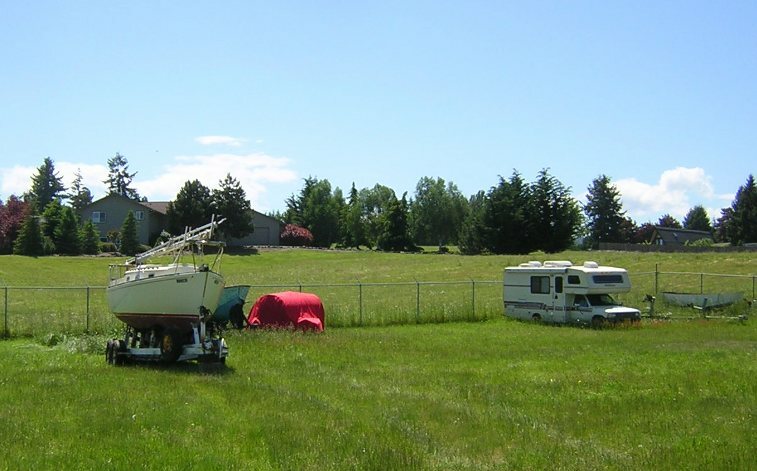 The boat and I also entertained my son, grandson, sister, and a neighbor on day trips sailing on the Columbia. I got my time on the water for sure. Linds Marie got new clothes in the form of a dodger, mainboom cover, winch covers, and a tiller cover. New name graphics from Boat US and registration numbers completed her new wardrobe. I am spending the winter in Florida and the boat is waiting under a tarp in my yard in Portland. March 21, 2016. Brad Miller advised us that #168 is FOR SALE. Here is his Craigslist ad and lots of pictures, more of which are in the Craigslist ad. I have decided to sell my Dolphin. It has been a great boat but life changes mean I get less and less time on her. My craigslist ad is at http://olympic.craigslist.org/boa/5499303277.html. Sequim is a ferry boat ride and one hour from Seattle. Solid little pocket cruiser with good performance and Comfort. Comes with Lazarette mounted Chrysler 6hp which I never even tried to start. I used a 2hp Honda which served me well in the bay. 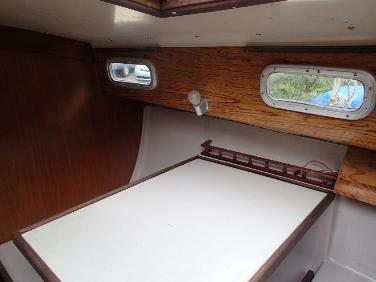 Interior Cushions, foam is in good condition upholstery needs replacement. 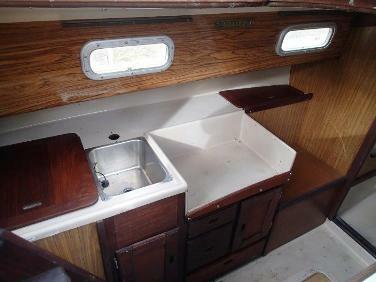 I have used the boat as a day sailor on the bay so it has not been outfitted with any electrical or electronics. Trailer Aros 1984 needs work. Brakes, Tires, Fender, Bunk.... Gets the job done for me only 4 miles to launch. Dolphin 24 web site (www.dolphin24.org) is great. See Photos below and website, I have additional photos and will answer any questions. I bought the boat out of a storage yard where it had sat for 10 years so I do not know the history of it. April 28, 2009. Brad checked as the new owner of # 168 with the following email and pictures. I just brought Yankee Dolphin 168 home. She's was a bit rough, but after a good hosing and a bit of scrubbing she cleaned up respectably. Her interior is completely torn apart. But most of the parts have been located and identified. 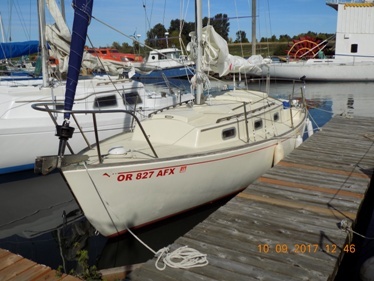 I am hoping to replace damaged cabin top rub rails and reset the cabin top hand rails, and the arch just to make her sailable. 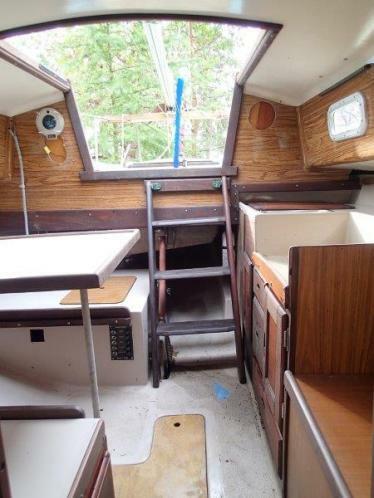 I'll leave the remaining interior cabin trim off for next winter projects. I've been pouring over your forum and tech section, a great source of information. I'll be needing to figure out what is absolutely necessary and what I can leave off till later. More on that later. She's listed in your For Sale section. Seattle/Vancouver Craigslist in October. Thanks for a great web site and for the effort to keep it going. It was invaluable in keeping me interested during negotiations and I am sure will be even more so as I get into this project. 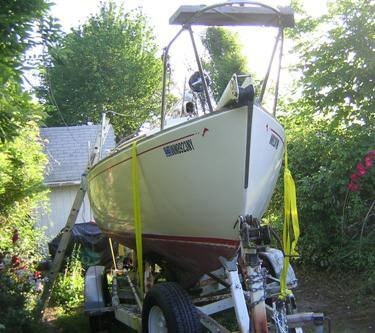 Selling my sailboat and trailer well below market price. 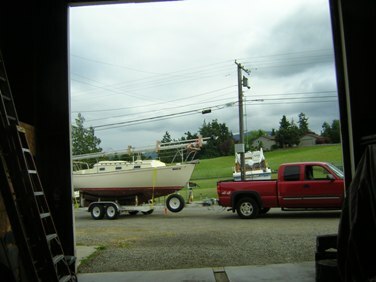 Moved back to Vancouver but the sailboat is still in Seattle storage unit. Will provide pics if interested.